The Cobra Office range, of Chubb safes, are quality cash safes offer both burglary and fire protection. The Cobra is ideal for stores, restaurants, small business and homes. It protects cash, documents, vital records and other valuable items.he Chubbsafes Cobra office safe range is designed primarily to provide protection against physical attack, it will also offer moderate protection against fire for paper documents only. • High quality construction with 10mm steel plate door and special Chubbsafes concrete body provides resistance against attack. • Available in five sizes, each fitted with a quality S&G Z03 digital lock. • The recommended cash rating is $20,000. • Fire protection for documents up to 30 minutes, tested in accordance to JIS S1037. • Independently tested safe in Australia for burglary protection certified by the Loss Prevention Certification Board of the UK. • Internal shelves and lockable drawers are standard on sizes 3,4 and 5 and are available as options on other sizes. The Profile Executive is an attractive, premium level record protection cabinet offering effective protection for vital documents from theft and fire, while complimenting modern office furniture, with a range of different colour finishes available. 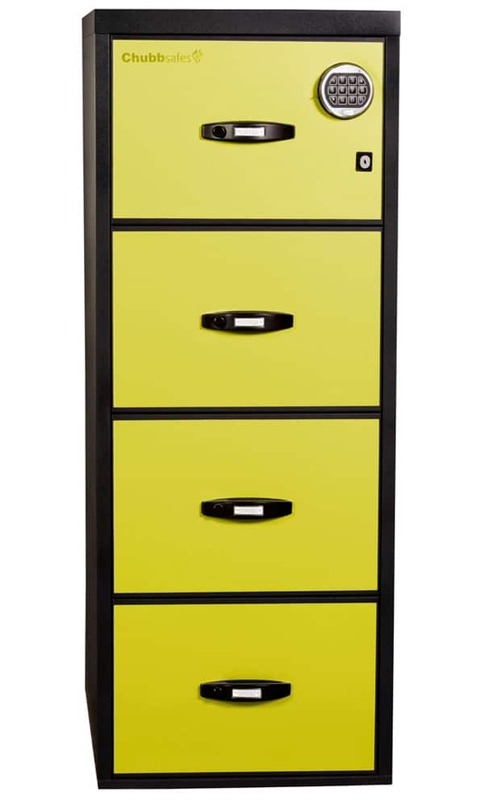 High Quality Filing Cabinet for efficient storage of important docments. Manufactured in accordance with ISO 9001 quality management system and the ISO 14001 eco-management principles. Fitted with fashion colour fascias to compliment the modern office. Choice of 4 standard colours, custom colours available on request.